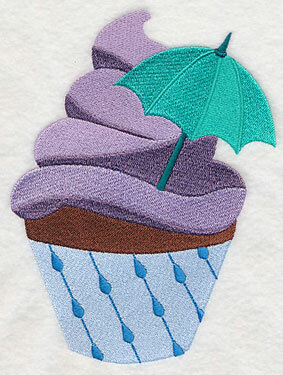 Each week we get sent dozens and dozens of inspiring design requests from creative stitchers. This week's Request-fest celebrates those exciting ideas with new special designs, inspired by you! 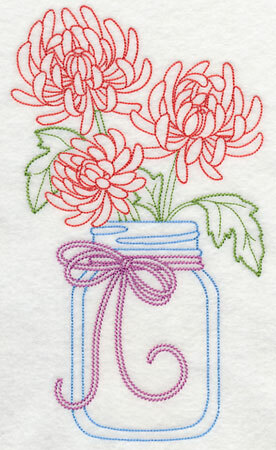 Mason jars filled with blooming flowers delight on tea towels and placemats. 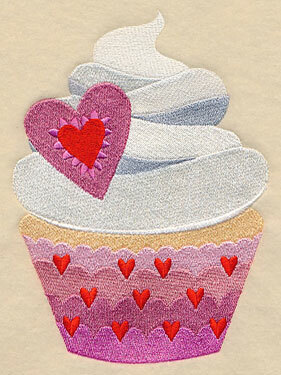 A calendar of cupcakes are fabulous on a quilt; cool animal silhouettes shine on pillows and totes. 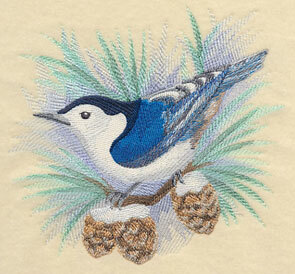 Plus, watercolor birds, bottle aprons, and more! 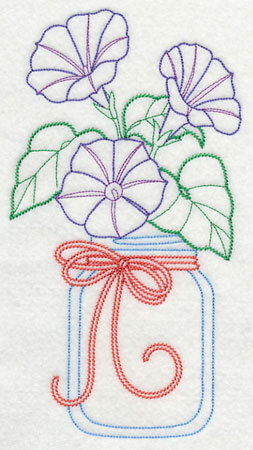 The light stitches and open spaces in this design makes it perfect for a tea towel! 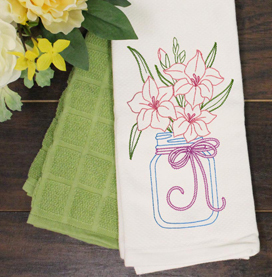 Carol was looking for a set of flowers in mason jars to decorate her kitchen, and we agreed that it would be a lovely addition to tea towels, placemats, and aprons. 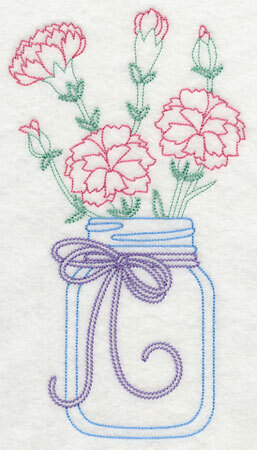 Here, carnations and violas bloom from a set of canning jars. 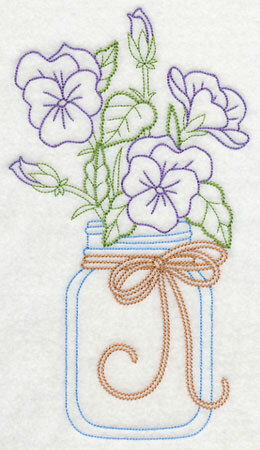 5.09" x 9.21" and 4.23" x 7.65"
5.23" x 9.30" and 4.30" x 7.64"
3.78" x 6.72" and 2.13" x 3.77"
When requesting these mason jar motifs, Carol noted she'd love to be able to switch the designs out as the months pass to match the changing seasons. 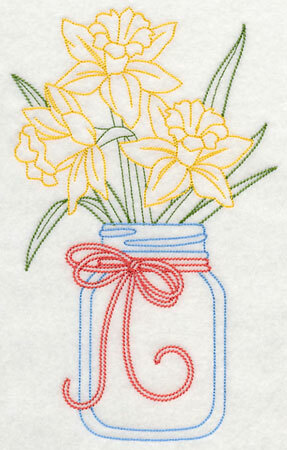 The flowers selected cover a variety of seasons -- like the spring daffodils and sweet peas shown here. 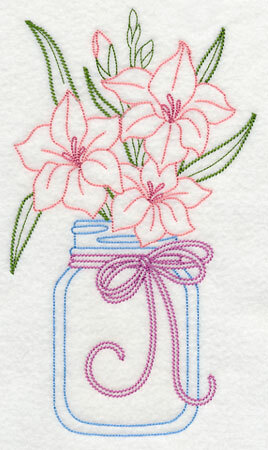 5.83" x 9.41" and 4.85" x 7.81"
5.60" x 9.21" and 4.65" x 7.65"
4.09" x 6.73" and 2.30" x 3.77"
Lily of the valley and roses look gorgeous blossoming in these mason jar designs. 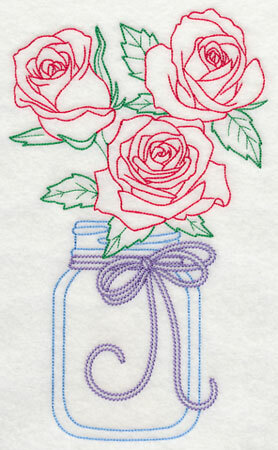 Each version features a colored ribbon tied around the jar for an even lovelier appeal. 5.82" x 9.32" and 4.83" x 7.73"
5.54" x 9.22" and 4.60" x 7.65"
4.04" x 6.73" and 2.27" x 3.77"
Larkspurs and gladiolus are classic summer flowers, and are known for their beautiful blooms. 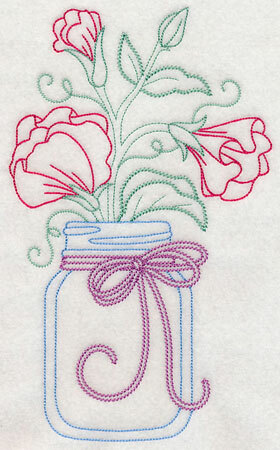 Because these designs are stitched in the vintage style, they feature open spaces between the stitches. 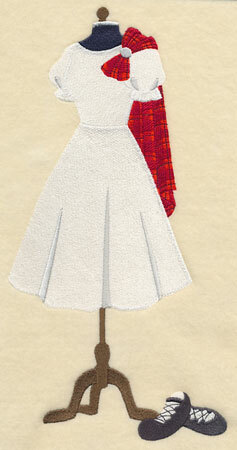 Great on low-nap fabrics, like linen, canvas, and twill. 4.77" x 9.23" and 3.96" x 7.66"
5.37" x 9.26" and 4.47" x 7.68"
3.94" x 6.76" and 2.18" x 3.79"
Morning glories and marigolds signal the start of fall, and are gorgeous when stitched on tea towels, tote bags, pillow cases, linens, and more. 5.03" x 9.27" and 4.18" x 7.69"
4.76" x 9.20" and 3.95" x 7.64"
3.48" x 6.72" and 1.96" x 3.77"
Pick your favorite floral mason jar design (like the chrysanthemums and poinsettias below), or stitch them all for a gorgeous collection of blooms! Terrific on a quilt, series of wall hangings, or coordinating dining set. 5.44" x 9.22" and 4.53" x 7.67"
5.56" x 9.18" and 4.62" x 7.62"
4.06" x 6.70" and 2.27" x 3.75"
These flowers are a lovely addition to kitchen, living room, and bedroom decor. Purchase the designs individually by clicking the links above. 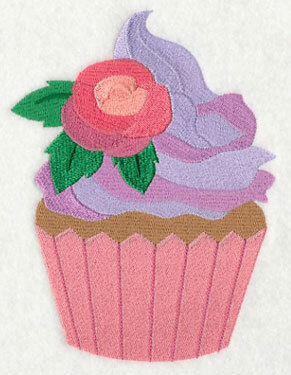 Linda was planning to make a calendar wall hanging featuring a variety of cupcake designs, and was hoping we could help her find an appropriate design for every month! 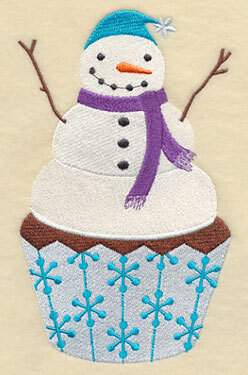 For January, we added a friendly snowman sitting atop a cupcake; February features hearts for Valentine's Day. 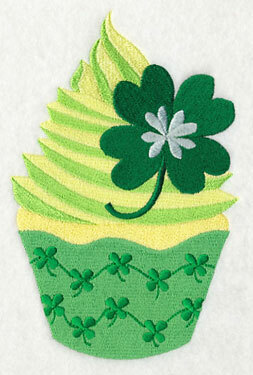 4.85" x 6.80" and 2.75" x 3.85"
Evoke imagery of the Emerald Isle with March's St. Patrick's Day cupcake, or stay dry with the umbrella on this April showers treat. 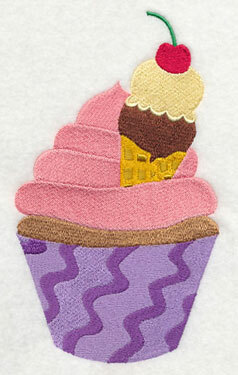 Whip up a quilt featuring the cupcakes as a delicious way to showcase your embroidery. 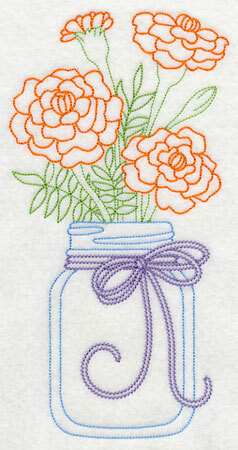 4.85" x 6.55" and 2.85" x 3.85"
May flowers are embodied in this rose accent; June features a beautiful butterfly. 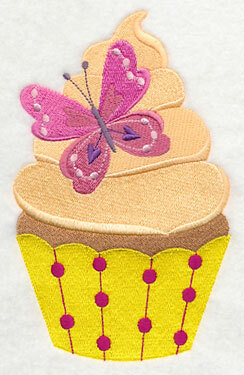 Each of the cupcake designs are bright and colorful, and look good enough to eat! 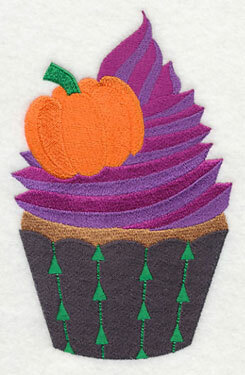 4.25" x 6.85" and 2.40" x 3.88"
Not only are these cupcakes tasty when stitched as a group, but you can pick your favorite to stitch alone too! 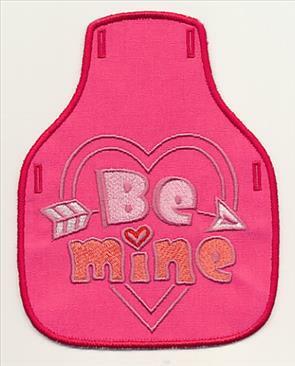 They're terrific additions to aprons, napkins, placemats, and more. 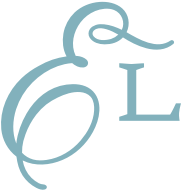 Visit on Projects site for dozens and dozens of tasty tutorials for the kitchen. 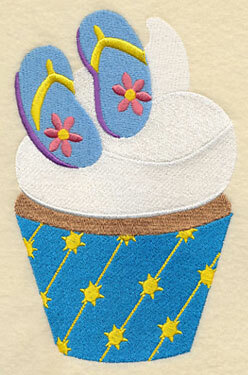 July celebrates summer with flip-flops and a shining sun, while August features a delectable ice cream cone. 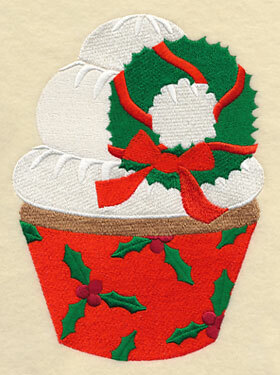 The cupcakes are a terrific way to switch out your decor for each season, or even each month! 4.00" x 6.86" and 2.25" x 3.86"
Pencils and an apple welcome students back to school for September, and is perfect for creating a fabulous teacher's gift. Creepy colors and a ripe pumpkin showcase October's favorite holiday -- Halloween! 4.35" x 6.85" and 2.45" x 3.85"
Finish off the year with a Thanksgiving turkey in November and Christmas wreath for December. 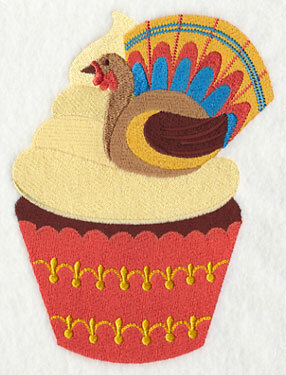 Not only are they great stitched alongside the other monthly cupcakes, but they're terrific for embroidering the holidays, too! 4.85" x 6.67" and 2.80" x 3.86"
In addition to the cupcakes of the month, a special birthday cupcake has been created, too. 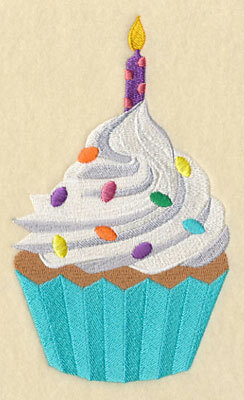 The candle is stitched on first three color stops, so you can easily skip it to stitch a cupcake fit for any celebration! 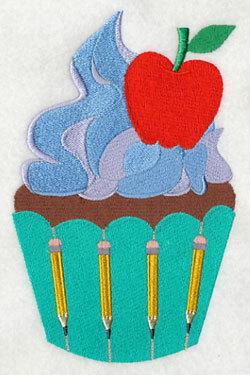 4.04" x 6.86" and 2.27" x 3.87"
Purchase these tasty cupcake designs individually by clicking the links above. 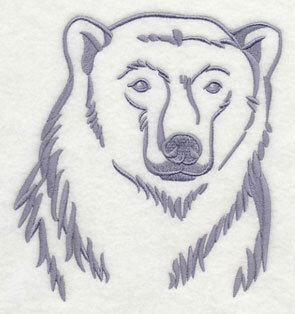 Barbie liked the way the Northwoods Animal Silhouettes design packs looked, and was hoping for something similar featuring Arctic and Antarctic animals. 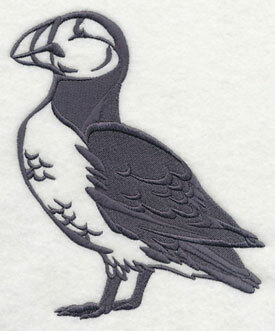 Here, a penguin and snowy owl are depicted in the one-color silhouette style. 5.86" x 6.14" and 4.87" x 5.10" and 3.69" x 3.86"
These designs feature open spaces where your fabric will show through, so select solid or simple fabrics when stitching. 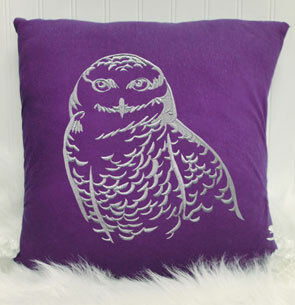 Here, the owl shines against a bold purple pillow. 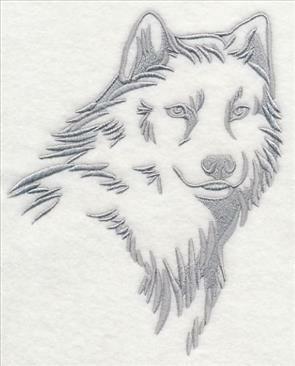 A majestic wolf and elegant caribou are traditional Arctic animals, and are stunning additions to sweatshirts, fleece jackets, or quilts. 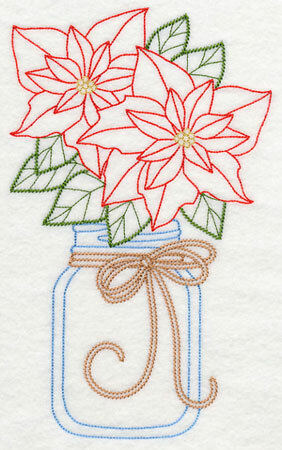 These silhouettes use only one color thread, and are fantastically quick-stitching embroidery designs. 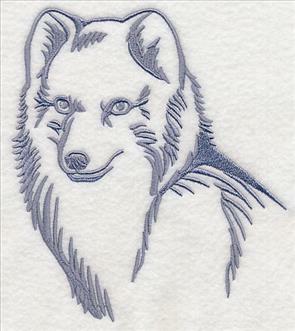 5.86" x 8.68" and 4.63" x 6.86" and 2.61" x 3.87"
The variety of stitches in these arctic fox and puffin designs gives each stencil-style animals fabulous appeal. Stitch in a variety of colors to contrast against your favorite fabric -- we love the idea of white on dark fabric for a stunning contrast! 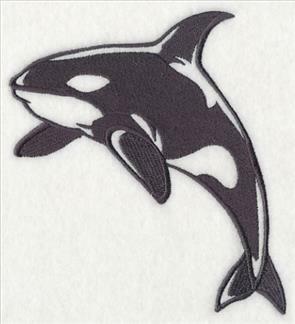 5.86" x 7.00" and 4.86" x 5.81" and 3.23" x 3.86"
A polar bear and orca, also known as a killer whale, are stunning additions to pillows, tote bags, apparel and more. 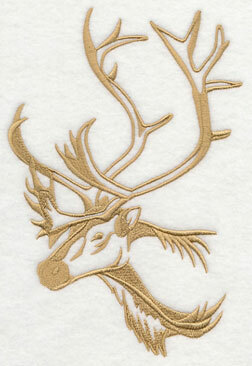 Use to add a wild look to your home decor! 5.87" x 6.20" and 4.86" x 5.13" and 3.67" x 3.87"
Barbie particularly asked for a salmon design in this silhouette style, and the bright red color gives it an eye-catching look. 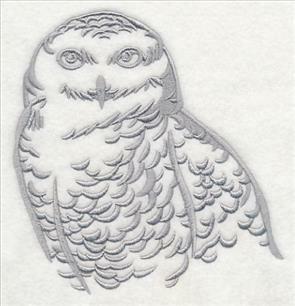 7.81" x 3.52" and 6.86" x 3.09" and 3.90" x 1.76"
Add an Antarctic or Arctic animal to your next embroidery project, or stitch them all! Purchase the designs individually by clicking the links above. Cara is a huge fan of the watercolor motifs, and was looking for a few designs to coordinate with the birds in her backyard. 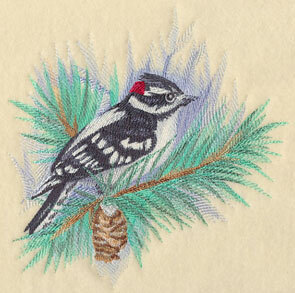 A downy woodpecker and nuthatch are brilliant when stitched in the painting-inspired style. 7.51" x 7.78" and 6.87" x 6.88"
7.26" x 6.82" and 6.14" x 5.83" and 5.05" x 4.83"
Pam loves curling up with a steaming hot cup of tea, and thought this saying was the perfect way to express her love for the drink. 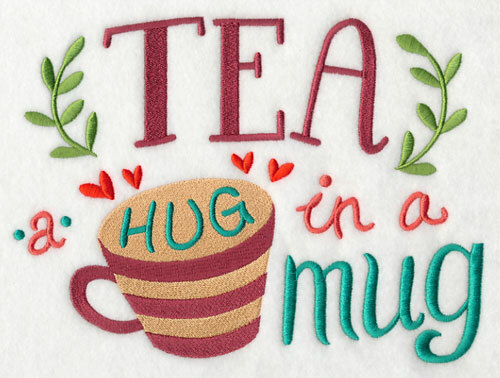 It's fabulous on pillows, towels, and more for your cozy tea nook. 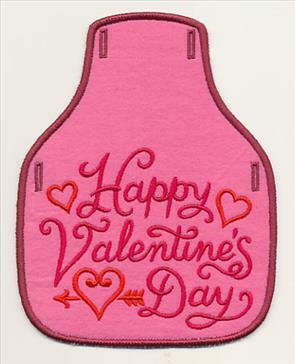 9.19" x 6.91" and 7.80" x 5.86" and 6.47" x 4.86" and 3.87" x 2.91"
Wish loved ones a "Happy Valentine's Day" with these bottle apron designs inspired by Wendell's fabulous request! 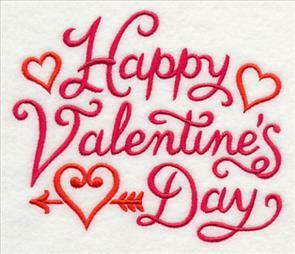 They're fabulous for adorning a bottle of vino on February 14. 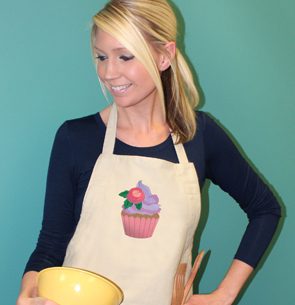 Find the step-by-step instructions for making these bottle aprons in this free tutorial. 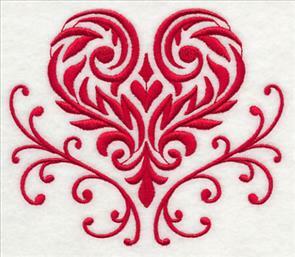 5.71" x 4.87" and 3.87" x 3.29"
This flourishing damask heart is a gorgeous way to celebrate love, whether it's on Valentine's Day, anniversaries, or just a sweet everyday gift. 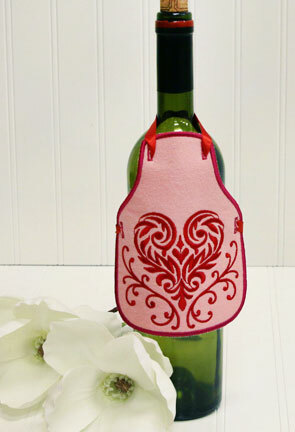 Use it to dress up bottles of wine, olive oil, dish soap, and more! 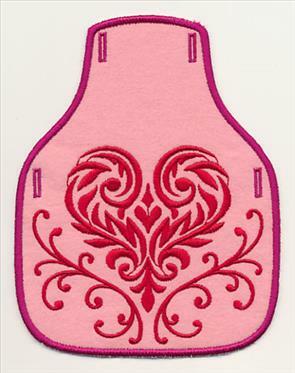 5.63" x 4.86" and 3.87" x 3.34"
These bottle aprons add personality to hostess gifts, wedding celebrations, and more. 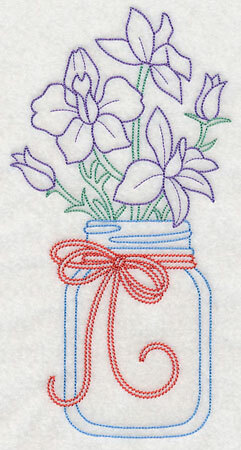 Find out our best tips and tricks for stitching the in-the-hoop designs in these project instructions. 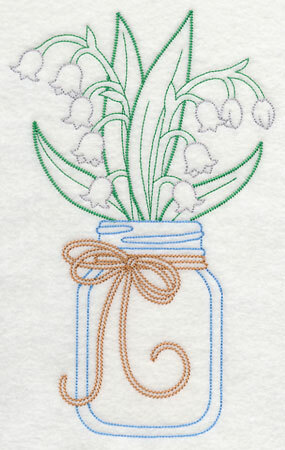 Each of the charming bottle aprons has a matching embroidery design -- terrific for adorning a coordinating tea towel, placemat, or gift bag. 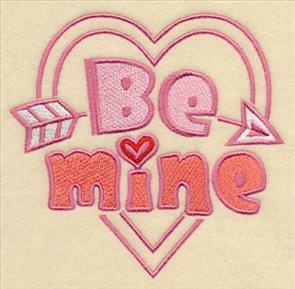 Stitch this "Be Mine" design for your sweetheart! 5.09" x 4.87" and 3.87" x 3.70"
Barbara requested a pair of designs to celebrate the intricate costumes of Scottish country dancers. 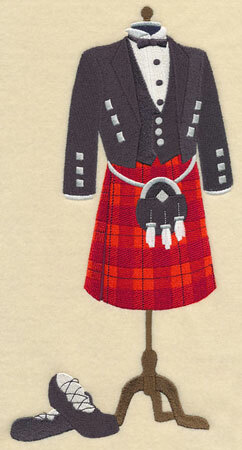 The tartan kilt is featured in both the male and female versions below, and is the symbolic national dress of Scotland. 6.16" x 11.72" and 4.93" x 9.37"
5.96" x 11.72" and 4.77" x 9.37"
3.96" x 7.78" and 3.50" x 6.88"